Mat Irvine reports: Here’s another look at iHobby Expo 2014, with a second group of kits due from Round 2 Models. Below, a stand display shows the six brands now assembled under the Round 2 umbrella. 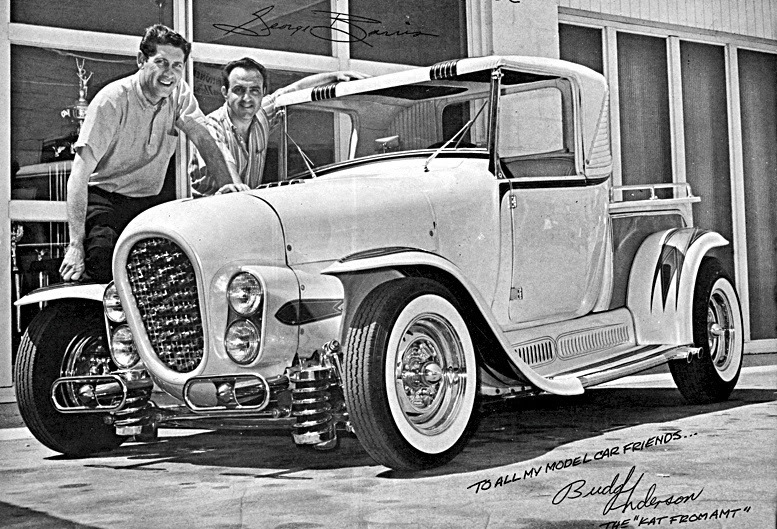 Budd Anderson (below left) with famed car customiser, George Barris. Note his signature and 'Kat' at bottom right. The car is George’s Ala Kart, kitted twice by AMT. This pic appeared in the 1962 AMT The Model Car Handbook. The AMT and MPC car displays included a new-tool MPC General Lee kit. Although it is a snap-kit this time around - without separate engine - the bodywork is more accurate than the long-standing injection kit. Mind you, that never stopped it from selling! I’ll be featuring other kits in individual articles. These will include the 1953 Studebaker, one of the best kits ever made by AMT. Below, stacked up kit goodies from R2. Lindberg ships and aircraft (below) with some reissues of AMT 1:48 scale aircraft. Note the AMT F-14 Tomcat from Top Gun, a kit which featured in a recent SMN. Below, detail of the lower shelves. Note the mix of automotive scales, with a 1:23 scale Studebaker Avanti, a middle pair to 1:25 scale, and a 1:20 scale AMC AMX. A selection (below) of vehicles from Polar Lights and Lindberg. Note the Little Red Wagon (top right). This was an IMC kit, but is now listed as a Lindberg release, as is the 1:32 scale 1940 Ford, which started out under the Pyro name. This range is still virtually the only one that does classic American cars in 1:32 scale. Below, more reissues from AMT include (top shelf) reproductions of boxes from a period when AMT issued them without text on the lid. They were marketed as frameable art for model makers. Star Trek subjects (below) continue to be released under both the AMT and Polar Lights names. The excellent AMT Hindenburg (below) in nicely weathered built-up form. This is just one of an AMT range of lighter-than-air craft that included the American Civil War balloon Intrepid. One of MPC’s large-scale car/truck kits (below) the 1:20 scale Ford off-road van reappears, along with the 1:25 scale MPC Mack DM600 Conventional tractor. The Mack started out as one of Ertl’s few injection styrene kits, and has also appeared at the ‘star truck’ from the movie Convoy. For the 1968 Annual series (below) AMT modified its usual lower-case ‘amt’ logo. Below, the Shell Dodge L700 tanker-trailer combo is another IMC original, though packed in a Lindberg box. Produced in several versions by IMC, it is the only kit ever made of this particular truck. This 1938 Custom Ford Van (below) also has a mixed heritage, as it started out as one of the very few kits from Testors. The kit was absorbed into the Lindberg catalogue, hence it has now been transferred to Round 2.